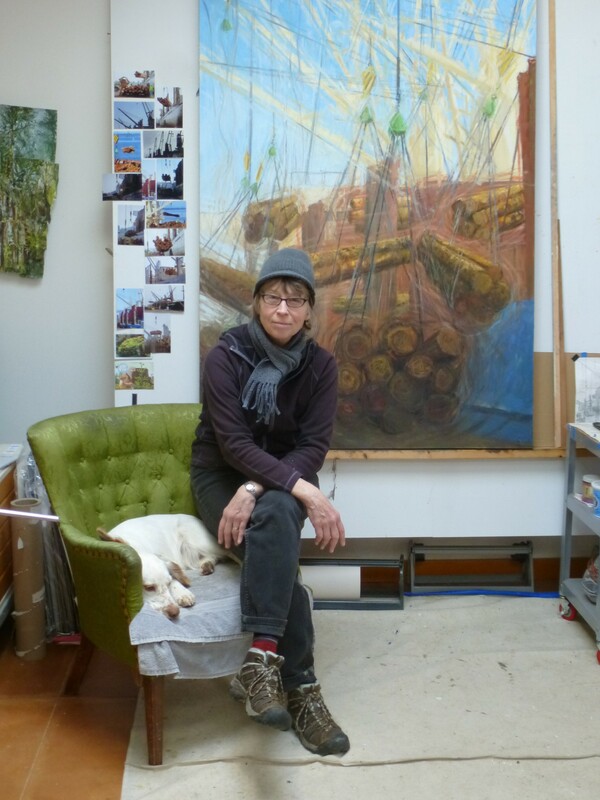 I am a painter who lives in Olympia, WA, working in oils on canvas and linen panels. Four years ago I shifted from working indoor to working outdoor (plein air) painting in my local Northwest forests. Moving from the studio to outdoors has helped me grow as an artist; changing how I work, how I see, and helping me to engage a larger context and a passionate narrative: Wealth and beauty; how does this affect my relationship to nature? My struggle to strengthen my relationship with nature has yielded many rewards. The intense observational study in the woods has brought me to the next fork in the road: the tree as a natural resource. I used to call the logs stacked on the trucks filled with a load of trimmed, topped and sectioned trees “Yesterday’s Forest”. In my mind, they were still my trees. As I drove past the Port of Olympia on my way to some of my wooded sites, my mind made another shift; I was witnessing their journey from the interior of my forest to the water’s edge where the logs embark on the next leg of their journey. The artist in her studio with her trusted assistant, Tag. As I continue working on my Port paintings, I know this story needs telling over and over in as many motifs as possible. In response to heated debates for years, activists and legislators have drawn and re-drawn the lines that divide exploitation and preservation. I am hopeful that the time I devote to painting my home town port may spark larger discussions and activate ideas across the lines we have drawn, offering up some new perceptions about community, wealth and beauty.